"I no longer do intubation. I do epiglottoscopy followed by laryngoscopy followed by intubation." 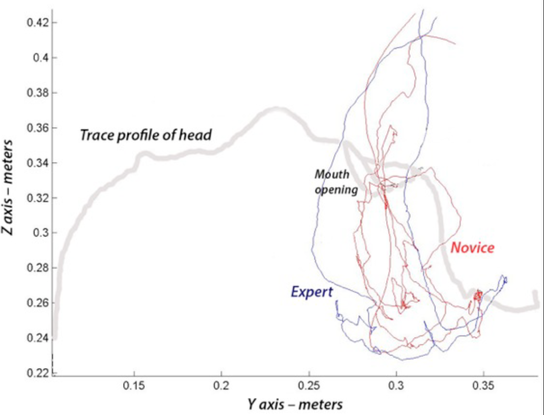 ​Perhaps the biggest difference between the novice and experienced intubator is that novices more likely to plunge the laryngoscope past the epiglottis, missing a crucial anatomical landmark. Delson NJ et. al., Anesthesia and Analgesia, 2002; 94; S-123. ​​This difference has been studied using a laryngoscope with a force and position sensor, and then comparing the intubating habits of novice and expert intubators. Experts moved the laryngoscope tip about half the distance of novices (109 vs 52cm tip travel), and required less time (12 vs 36 seconds). ​As Rich Levitan says, "The secret to intubation could be reduced to one word: the epiglottis." This holds true for both direct and video laryngoscopy. In the example on the right, the CMAC 3 laryngoscope tip is plunged past the epiglottis. Without this crucial landmark, it's easy to become disoriented in this muck of floppy tissue. ​The epiglottis is much higher in the neck than novice intubators may appreciate, which may explain the tendency to shoot past it. 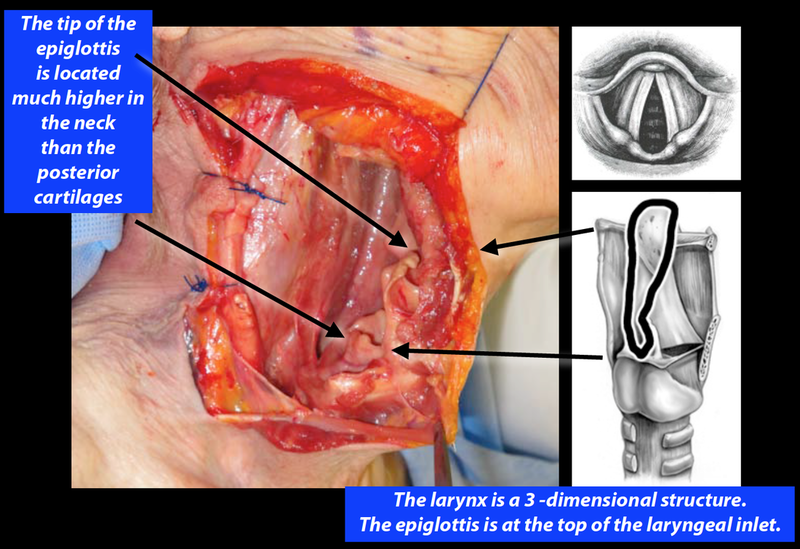 As Dr. Levitan puts it, the epiglottis is the onramp to the cords. If you miss it, then you risk missing the glottic opening. ​Experienced intubators advance the laryngoscope in a methodical and progressive manner until the epiglottis is seen. Then small adjustments are made until the tip of the MAC blade is seated into the valeculla, lifting the epiglottis to expose the cords. This is demonstrated on the mannequin here. Take another look at the first video and see if you can find the points at which the epligottis is missed. ​In this last case, the laryngoscope the CMAC blade elevates the tongue so that the oropharynx can be suctioned. It is then advanced until the epiglottis is apparent. The tip of the blade is then advanced into the vallecula, lifting up the epiglottis. Notice how minor adjustments of the laryngoscope tip into the vallecula allow for elevation of the epiglottis and good exposure of the cords. Have you been reading this post wondering who this Rich Levitan guy is? He's a brilliant EM physician and an expert on airway management. Learn more about epiglottoscopy and other airway issues in his excellent airway lecture below.